A new material has the science community excited about reducing the cost of solar energy: perovskite. This material, used first in 2009 for solar energy, has power conversion efficiencies of sunlight to electricity already above 20%. For comparison, silicon based solar panels, the common commercially used material, are about 22% efficiency. Perovskite is close to matching this efficiency, but would be much cheaper than silicon to produce, as perovskite doesn’t require the expensive purification processes that silicon does. There is, however, a major drawback to new perovskite solar cells: they are based on lead, which is banned in the EU for electronics and is publicly disfavored. This research presents a new type of nanocrystal material, that is based on the perovskite structure but without the lead. 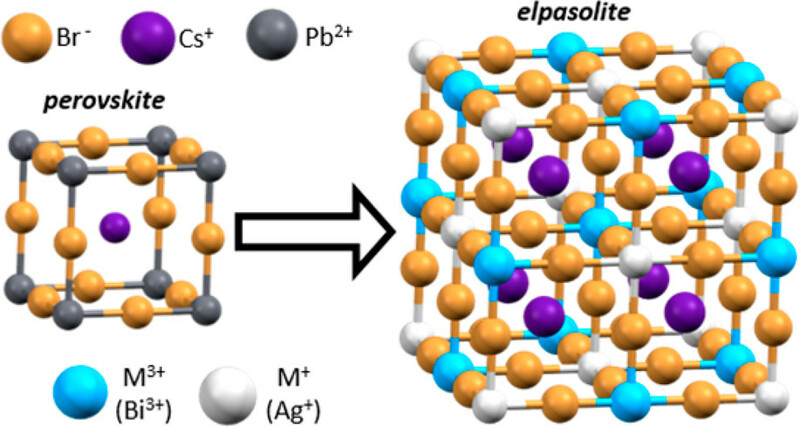 Based on previous work, lead (Pb2+) was replaced in perovskites by making a double perovskite with Ag1+ and Bi3+. If you replace 2 Pb2+, with Ag1+ and Bi3+ cations, you have a charge balanced 3D structure (Figure 1) needed for the high efficiency solar materials. Of course, this comes with drawbacks: the double perovskite (called elpasolite after the mineral) has different bonding and can only be made with bromide and chloride, not iodide, which makes it a weaker absorber of light compared to the lead iodide compounds. Absorbing maximum amounts of sunlight is important for a good solar material. These scientists at the University of Washington-Seattle found a way around the iodide issue. By making the elpasolite structure in a nanocrystal, the small surface area allows an iodide based structure to be formed into a semi-stable nanocrystal. 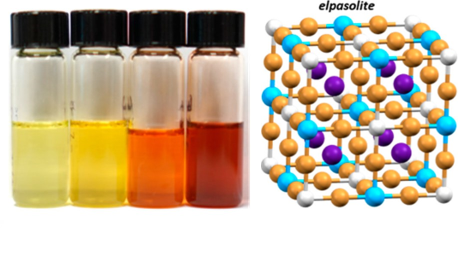 This is the first report on a robust synthesis of elpasolite nanocrystals and provides a lot of opportunities for investigations into its physics and materials properties. Figure 1: Crystal structure of (Left) Pb2+ based perovskite and structure of (Right) Ag1+ and Bi3+ based double perovskite (elpasolite). This new synthesis of double perovskite nanocrystals is achieved by making a mixture of silver, bismuth, and cesium acetate (precursors) in the high boiling solvent octadecene with ligands added in. The ligands are oleylamine and oleic acid, which cap the surface and prevent the crystal from growing too large. By heating this mixture, and injecting the very reactive trimethylsilyl bromide (TMSBr) into it, nanocrystals of Cs2AgBiBr6 are successfully crashed out of solution. The ligands were effective in preventing them from growing too large. The reaction scheme is shown in Figure 2. The nanocrystals formed are 8 nm edge length cubes shown by transmission electron microscopy (TEM) images (Figure 3). They exhibit photoluminescence as expected for this material in nanocrystal form. The nanocrystals also demonstrate quantum confinement, which is when a solid material is made very small so that it has unique, discrete interactions with light. This is shown by the absorbance spectra which looks like mixture of a molecule (a sharp exciton peak at 2.8 eV) and a bulk absorbance (broad absorbance past 3 eV) (Figure 3). Figure 2. (A) reaction scheme to grow elpasolite nanocrystals. (B) Scheme showing the exchange of halides, adding TMSX (X = Br, I) induces the anion exchange. 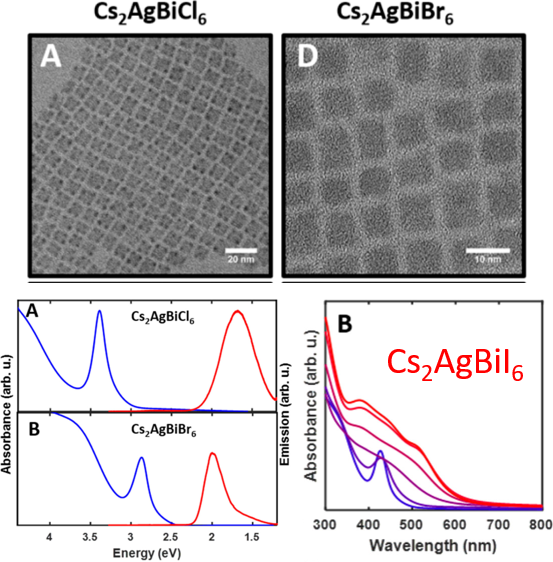 The researchers where then able to take the formed Cs2AgBiBr6 nanocrystals and utilize a process called anion exchange to access the structure Cs2AgBiI6 which could not be made directly with a hot-injection synthesis. They subjected nanocrystals of Cs2AgBiBr6 to a treatment of TMSI, which exchanged bromide ions in the structure for iodide ions (Figure 2B). This process was confirmed by the change in absorbance spectra. As more TMSI was added, the absorbance wavelength red-shifted to lower energies (Figure 3), as expected with the inclusion of iodide. This is the first time this material Cs2AgBiI6 has been made. Figure 3. (Top) Transmission electron microscopy (TEM) of the nanocrystals synthesis. (Bottom left) Absorbance (blue) and emission (red) spectra of the NCs, showing the quantum confinement indicated by the sharp blue peaks. (Bottom right) Absorbance spectra of the nanocrystals with TMSI added sequentially, showing the red shifted absorbance features. This work is exciting for multiple reasons. These are the first double perovskite quantum dots to be made, which has many opportunities from solar cells to LEDs. The synthesis seems quite robust and researchers in applications or fundamental physics can begin to explore these materials. This work also shows for the first time access to the iodide phase. The iodide based structure has a greater chance of being utilized in solar applications, as it absorbs more light than the bromide. 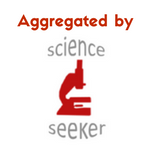 It will be exciting to see where other researchers take these materials to expand on this initial work.